Argentum MyFiles is a cataloging tool that keeps your files organized. It can be used as a file organizer, a disk cataloger, a music organizer, a photo album, a software catalog and more. You can keep detailed descriptions with any file or folder you may have in your collection. After building catalogs, you can use a powerful search, create HTML, XML and CSV reports, browse and access your files directly from within Argentum MyFiles. Argentum MyFiles 2.50 is a shareware program and can be used as a demo to try the software until the free trial period has ended. A full version of the program is available after the trial period ends. 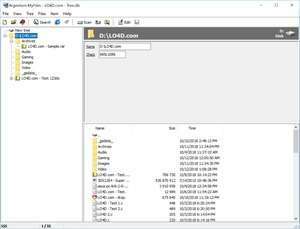 For security reasons, you should also check out the Argentum MyFiles download at LO4D.com which includes virus and malware tests. Additional screenshots of this application download may be available, too. Software in this category is generally used to organize and cleanup your files and directories. The top programs offered are freeware and contain no restrictions. Check out some of the freeware downloads available in the file organizer category. They contain no strings and are available at zero cost. Argentum MyFiles has a presence on social networks.